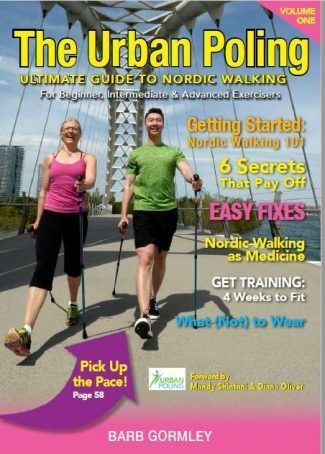 This engaging 67-page full-colour digital guide is packed full of information for beginner, intermediate and advanced Nordic walkers. Topics include: how to set up your poles; proper Nordic walking technique; technique troubleshooting; what to wear; the top 20 FAQs; how to pick up the pace; train for a 5K; motivational stories from newbie and experienced Nordic walkers, and much more. Fitness expert, Urban Poling director of education and professional writer Barb Gormley offers loads of tips, tricks and resources to help make your Nordic walking experiences fun and effective. Loved the FAQ article, especially the question that described the difference between hiking poles and Nordic walking poles and hiking and Nordic walking. This book is a fantastic resource. So easy to understand, lots of inspirational stories and great photos! Love the book! Nice balance of useful info and personal stories. Well done! WOW! Excellent publication. Congratulations to all who were involved in producing this. Love the book! Great tips, great layout that is very attractive and easy to read, great photos.